In the East Bay, fire danger is already sky high. In the hills above Orinda, multi-million homes are being protected by what firefighters call defensible space. Thom Jensen reports. It was not just hot Friday, it was downright crispy across the Bay Area, where temperatures are expected to go from scorching to dangerous over the weekend. In the East Bay, fire danger is already sky high. 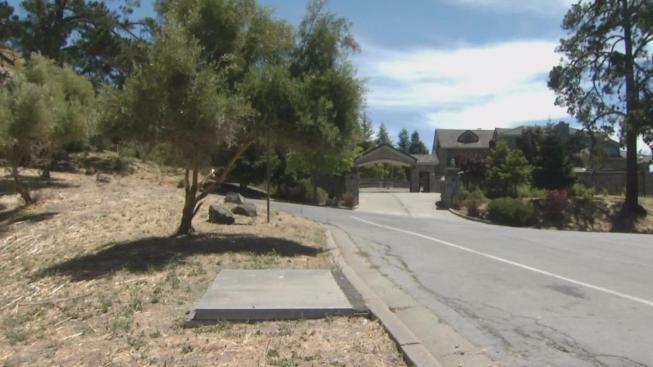 In the hills above Orinda, multi-million homes are being protected by what firefighters call defensible space. Healy said that the owners of 99 percent of the 14,000 homes in his district comply with the department’s mandate to clear 100 feet around every structure. Creating that buffer means removing garbage, grass and low-hanging limbs. “We're not asking for a moon scape, and we're not suggesting people should not have any vegetation around their house,” Healy stressed. Every year, homeowners are warned that they have to get that defensible space cleared by June 15, when the red tag season starts. “Because you're not just protecting your house. You're protecting your neighbor's house and the people's down the street's house,” said Paul Ramirez with the Moraga Orinda Fire District. To that end, fire prevention and enforcement crews put tags on homes warning residents to obey or face fines, which can range from cleanup costs to a lien on a house, to cover the cost of having fire crews clear space. “We don't want it to come to that, but if it has to, it has to,” Ramirez said. In the Moraga-Orinda hills, nearly every property owner is doing it right, Healy said, even forming associations – like the Diablo Firesafe Council – and getting grants to help pay for the necessary fire prevention tactics. “It’s just a perfect example of neighbors working with neighbors, and working with us as a public agency … for the best possible outcome,” Healy said.